On the first Tuesday of every month, The Bookstore Plus hosts a unique Book Club experience where readers have the opportunity to discuss the book club pick with the author via video chat! 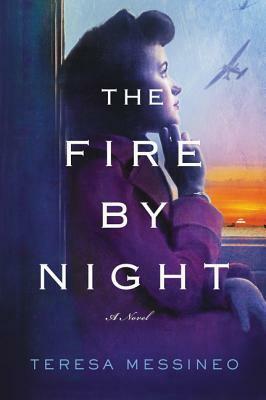 Tuesday, November 6th, 2018, at 7:00 pm the author, Teresa Messineo, will join us to discuss and answer questions about her book The Fire By Night. Our book club is open to the public. To honor the author's valued time, we highly recommend that you read the book and browse through any provided book club guides prior to attending the book club meeting. 1943: World War II engulfs three continents. At its heart stand two women: U.S. Army nurses whose extraordinary heroism you have never heard of but will never forget. In war-torn France, Jo McMahon, an Italian-Irish girl from the tenements of New York City, tends to six seriously wounded soldiers in a makeshift field hospital. Enemy bombs have destroyed her unit, and now Jo single-handedly struggles to keep her patients and herself alive in a cramped and freezing tent as German troops advance. There is a growing tenderness between her and one of her patients, a Scottish officer, but Jo's heart is seared by the pain of all she has lost and seen. Nearing her breaking point, she fights to hold on to joyful memories of the past, to the times she shared with her best friend, Kay Elliott, who she met in nursing school. Half a world away in the Pacific, Kay is trapped in a squalid Japanese POW camp in Manila, one of the thousands of men, women, and children whose fates rest in the hands of a sadistic enemy. Far from the small Pennsylvania town of her childhood, Kay clings to memories of her days posted in Hawaii, and the handsome Navy flyer who swept her off her feet in the weeks before Pearl Harbor. Surrounded by cruelty and death, Kay battles to maintain her sanity and save lives as best she can . . . and live to see her beloved friend Jo once more. When the conflict, at last, comes to its end, Jo and Kay discover that to achieve their own peace, they must find their places--and the hope of love--in a world that's forever changed. With rich, superbly researched detail, Teresa Messineo's thrilling novel brings to life the pain and uncertainty of war and the sustaining power of love and friendship, and illuminates the lives of the women who risked everything to save others during humanity's darkest hour. Teresa was alternatively schooled until her Freshman year, after which she transferred to a conventional high school. An honor student there, she earned a full scholarship to DeSales University where she ultimately won the Ross Baker Award for Excellence in Writing, that university's highest honor for writing. She graduated with a BA in English in 1994, with minors in Biology and Theology, and earned her ICCE and LIBSS while teaching at Pennsylvania's premier birthing center. Teresa passes on her love of learning through home schooling, even as she keeps an eye on medical missionary work for herself after she finishes educating her own kids. Teresa combines her love of medicine and writing in The Fire by Night.